Care Today set up the Make a Difference fund in the immediate aftermath of the tsunami of 26th December 2004. We collected Rs.2,81,48,229 in contributions, and have made grants (as on 31st July 2008) of Rs. Rs.2,48,80,247 in Nagapattinam and Tirunelveli districts of Tamil Nadu, Karaikal sub-division of Pondicherry, and in the islands of Little Andamans, Car Nicobar, Great Nicobar and the Nancowry Group. The first grant of Rs. 4.41 lakhs was to enable an emergency medical team from St. John's Hospital in Bangalore reach the worst-hit Nicobar Islands within three days of the disaster. We also set up a boat service between a remote relief camp and the administrative centre of Katchal Island in the Nancowry Group of the Nicobars in January and February 2005. 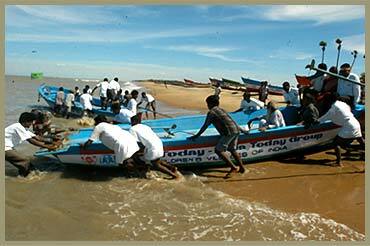 We have since supported a variety of activities - from land reclamation to construction of community infrastructure, supply of boats, support to children in distress, educational scholarships and rebuilding of livelihoods - in the worst-affected parts of Tamil Nadu, Pondicherry and the Nicobar Islands. Two activities continue - a project to build three community warehouses in villages in Nagapattinam district, and an educational scholarship scheme for Nicobari youth. Click here for the details of the projects. Care Today thanks donors for their contributions. This project is closed and we are not seeking donations for this project. Using Rs. 2.8 crore donations we supported: Upkeep of 1321 children Deployment of medical teams. Facilitating connectivity of remote islands. Provision of 23 boats to 92 families and fishing nets to 192 families. Restart business of 43 families. Support 350 women to procure fishing baskets. Support to 287 women through construction of fish storage sheds. Desilting of 534 acres of land. Construction of five warehouses and construction of fish drying yard. Education support to 31 students.